Product review: Helicopter lesson – by anon, 13 Jun 17 5/5 Excellent "Really easy to book. And even recieved a call to book in the date which was fantastic. It was easy to find and they even have their own cafe with complementary coffees. Staff were friendly and dealt with everything perfectly. The safety checks that were carried out were precise and accurate. Easy to understand and covered every aspect.I booked it for my fiance and he didnt even have to ask any questions, he understood perfectly.Even as a passenger I felt safe and comfortable, the whole experience was amazing. I would definitely recommend to anyone. I had plenty of photos taken and my fiance even got a certificate which was amazing. Experiences4all: 5 star!! Fantastic. Top marks. " 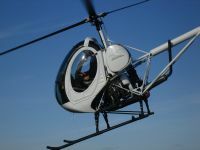 After receiving a pre-flight briefing you will take to the skies in a Schweizer 300CBi which is a modern two seat training helicopter. Once airborne you will have chance to take the controls and experience flying for yourself. Once safely back on the ground you will be awarded a certificate of achievement. Maximum weight 16 stone. Maximum height 6'4". Christchurch, Dorset BH23 6NW . Really easy to book. And even recieved a call to book in the date which was fantastic. It was easy to find and they even have their own cafe with complementary coffees. Staff were friendly and dealt with everything perfectly. The safety checks that were carried out were precise and accurate. Easy to understand and covered every aspect.I booked it for my fiance and he didnt even have to ask any questions, he understood perfectly.Even as a passenger I felt safe and comfortable, the whole experience was amazing. I would definitely recommend to anyone. I had plenty of photos taken and my fiance even got a certificate which was amazing. Experiences4all: 5 star!! Fantastic. Top marks. Arranging date was easy, but unfortunately due to bad weather 1st date was canceled. I found getting to the venue easy. The staff were very friendly and all the equipment seemed to be well maintained and good. The briefing was very good and made me feel confident. I had a great experience; unfortunately it wasn't as long as paid for half an hour and only got 20-25 minutes. The flight was delayed by half an hour due to weather. I understand we had to turn back because of bad weather. We only got as far as Bournemouth pier when we should have gone to sandbanks. Even thought we didn't get as far as planed still had a brilliant flight! Didn't hang around after as weather was wet and windy by then. Experinces4all were very help full and friendly.